If you are new to the ice fishing world, there are things you need to know to make the whole experience a success. For those who are within a small budget but want to keep things warm, it is important for them to be aware of the best ice fishing shelters. 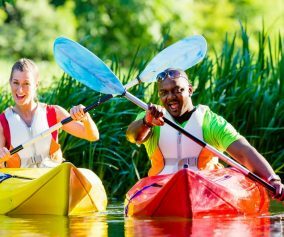 Whether going with friends or alone, it’s also important to pick the right shelter for yourself irrespective of the kind of cold climate you will be fishing in. Worth every penny, the Eskimo Fatfish 949i Insulated Pop-Up Shelter is the best portable ice shanty an ice fisherman could ever have. It is the hottest ice shelter with an affordable price tag. Inheriting the durability and technologies from its Eskimo ancestors, the 949i is destined to give you the best shelter in those icy lands. Weighing 34 lbs, the Eskimo Fatfish 949i Insulated Pop-Up Shelter can easily accommodate 3-4 people, featuring an area of 61 square feet. This shelter comes with a set-up size of 94”×94” and elbow room of 99”×99”. This ice fishing shelter features IQ Insulated Quilted Fabric to ensure you get more warmth than you could actually ask for. Featuring the typical Eskimo red shade, this pop-up portable is equipped with 6 large removable windows thereby exposing you to more viewing area, angle and configuration. This Eskimo fully insulated pop-up shelter model is also made up of two layers of IceTight fabric and one layer of insulation thereby assuring you to provide with maximum protection from the most freezing conditions. This insulated shelter provides 35% more warmth than any non-insulated shelter; moreover, such wonderful engineering in the insulation section is guaranteed to keep you warm and cosy in the most frosty, snowy, chilled temperatures. 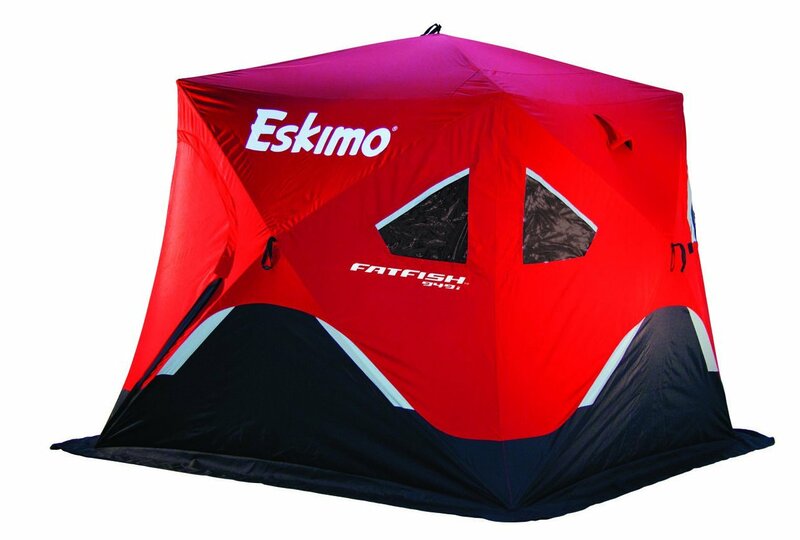 Eskimo Fatfish 949i Insulated Pop-Up Shelter is equipped with two doors on opposite sides of the shelter, each of which features YKK zippers which are tough, smooth and durable. In addition, it includes 6 self-tapping ice anchors that are guaranteed to withstand intense pressure and also comes with large mesh pockets for additional storage of your essential ice fishing gear. 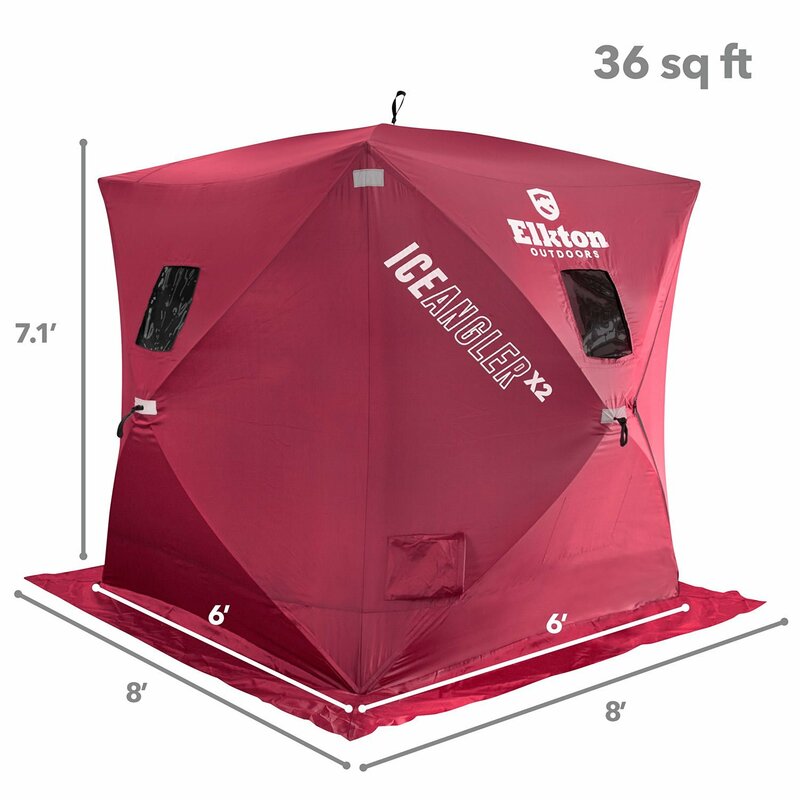 As the name itself suggests, the Elkton Portable Pop-Up 3 Person Ice Shelter Fishing Tent/Shelter/Shanty/Hut/House has a capacity of accommodating 3 people inside its seductive warmth chamber amidst the bitter cold lands. One of the cheap ice shelters, this model from Elkton is definitely hands-down one of the best in its category. Coming in a default and official reddish pink shade, this pop-up shelter is definitely worth a try for ice fishermen! Constructed with sturdy hubs backed with reinforced bottoms, the amazingly designed Elkton Portable Pop-Up 3 Person Ice Shelter is the perfect 3 person shelter which is not only easy to set up and transport, but at the same time is secure and assures to provide you with the all the necessary warmth you could crave for. Weighing only 18 lbs, this spacious shelter occupies a handsome area of 36 square feet with measurements of 6 feet in length, 6 feet in width and 7.1 feet in height. It has a set-up size of 72”×72” and elbow room of 90”×90”. This Elkton ice fishing shelter is built tough. 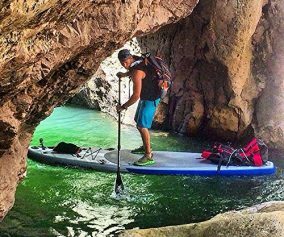 Made of 300D Polyester black backed coating it ensures maximum insulation and durability, and at the same time is UV protected and fully waterproof. The Elkton Portable Pop-Up 3 Person Ice Shelter also features 4 strong self-tapping ice anchors which are easy to grip and amazingly unbendable even under intense pressure, thereby keeping you secured and worry-free to the maximum! The shelter also includes one large ceiling mesh storage pocket on the inside to keep your essential ice fishing gear handy. The Elkton Portable Pop-Up 3 Person Ice Shelter is highly portable; it fits comfortably in a backpack carry case which comes with the total package. 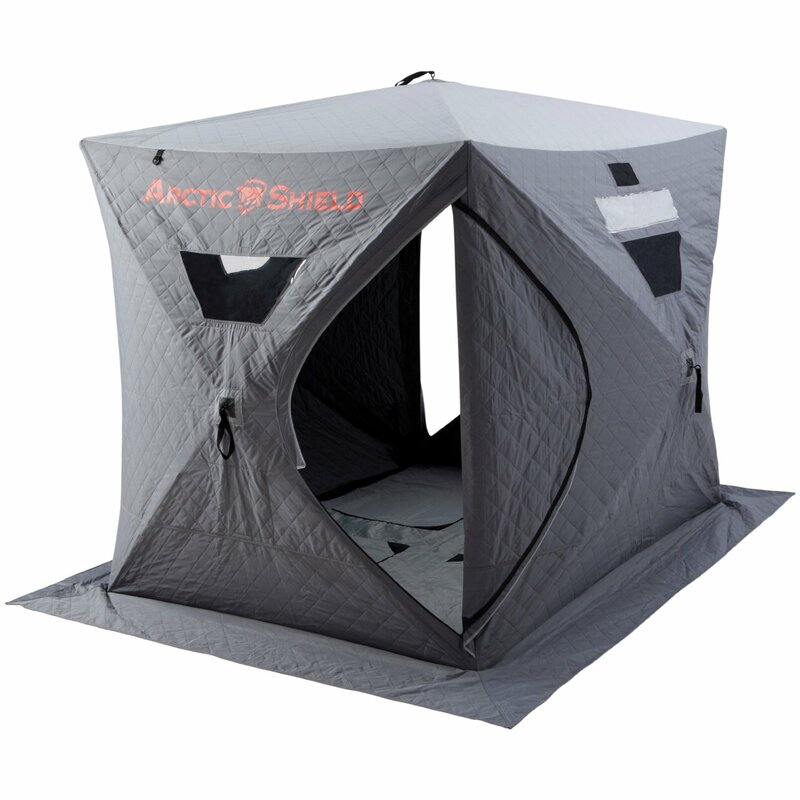 This ice fishing tent features one door and 4 detachable windows for maximum view of the icy world outside. Such a durable and toughness-redefined masterpiece from Elkton is really worth a catch for ice fishermen on the go! 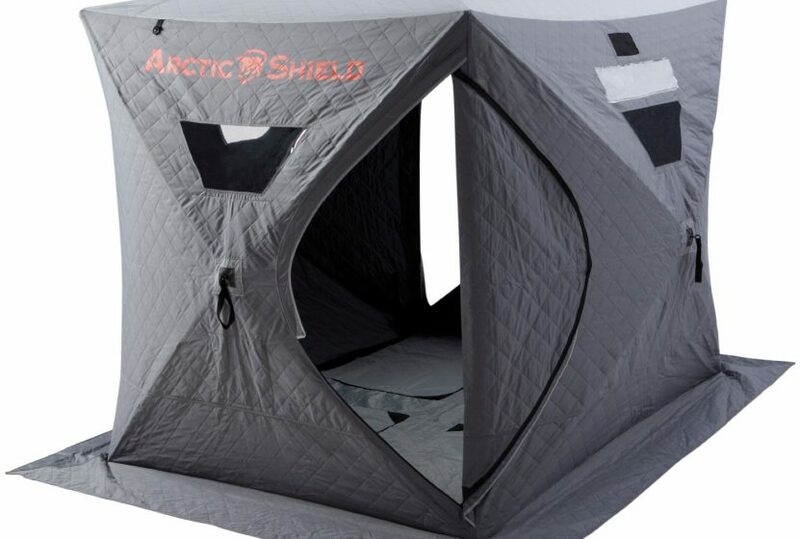 The Onyx Arctic Shield Double Layer Ice Fishing Shelter with Floor is a cheap all-rounder ice fishing tent which has taken the market by storm. Posing itself as a tough competitor, this shelter from Onyx is really a grab for ice fishing lovers. 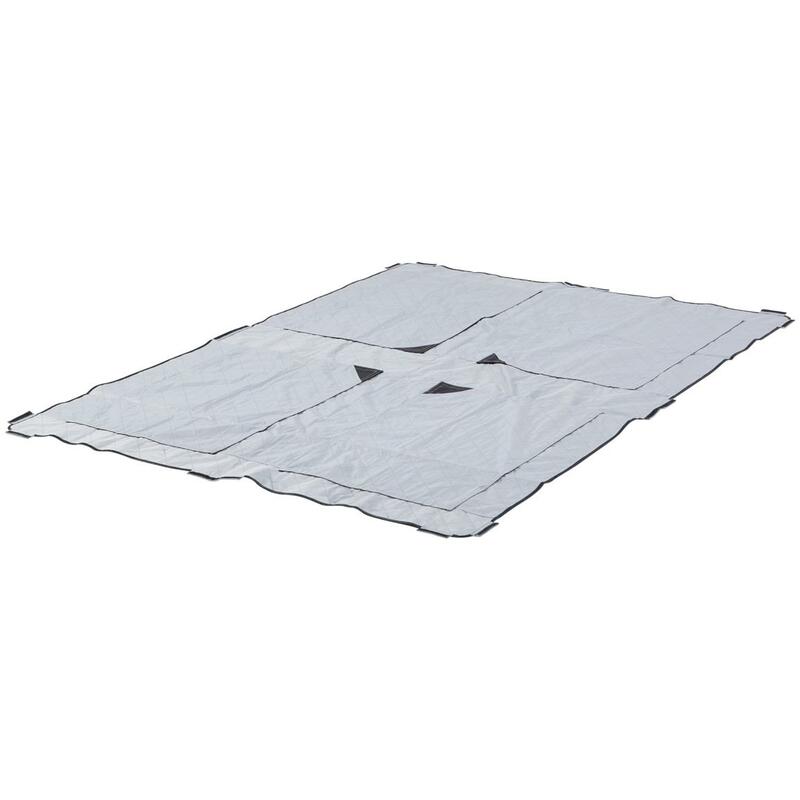 This model from Onyx is the best value for money tent and is built to last for seasons. The Onyx Arctic Shield Double Layer Ice Fishing Shelter with Floor possesses a double layer heavy-duty quilted polyester construction for maximum efficiency, warmth and durability. The double layer definitely allows for sky-high warmth and at the same protection that you have never imagined before! This pop-up shelter can be set up quickly with ease and conveniently rolled up when not in use. This remarkable shelter has a capacity to hold up to four anglers and has dimensions of 72” (length) ×96” (width) ×84” (height). The cosy thermal floor indeed keeps you warm even in the coldest of conditions. This ice fishing tent also features 4 windows for maximum view coupled with 2 zippered doors on opposite sides which are both smooth and tough. The highly efficient Arctic Shield Double Layer Ice Fishing Shelter with Floor is equipped with Fiberglass support poles which are engineered to be lightweight and highly durable, thereby making you stop your endless worries. The floor is however, a fantastic one, which is removable and consists of the legendary heat retention technology to help you keep yourself warm and dry even in the harshest of days and at the same time allows easy access to the ice floor. In addition, this heavy duty ice harbour shelter is mildew and fade resistant, hence assures you to go out with the exact same beautiful shade for several seasons. If you’re looking for something which is very easily portable, easy to set up and at the same time quite affordable, then the Clam Bigfoot XL6000 Pop-Up Ice Fishing Shelter is the perfect one for you! 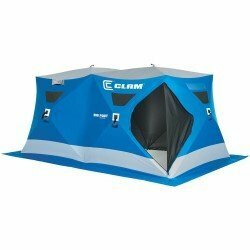 While being the top trend in the market right now and serving as a tough competitor of the Eskimo, this Clam Bigfoot XL6000 Pop-Up Ice Fishing Shelter is the best in class and is surely a dream shelter for ice fishing lovers. Occupying an impressive area of 112 square feet, the Clam Bigfoot XL6000 Pop-Up Ice Fishing Shelter can easily accommodate up to 8 anglers – so you can really fish HUGE! This model from Clam is designed to deliver more fishing room along with loftier headroom. The Clam Bigfoot XL6000 Pop-Up Ice Fishing Shelter weighs only 50 lbs and is easy to carry around, thanks to the oversized carrying bag which comes with the shelter. The Clam pop-up shelter has dimensions of 96” length×168”width×82”height and can be used for your adventurous camping, sporting events, as a hunting blind and definitely for ice fishing. Made from an ultra-durable 600 Denier fabric, this pop-up shelter is twice as tough, durable and long-lasting compared to the other shelters manufactured by the top competitive brands. The Clam Bigfoot XL6000 is the best ice fishing shelters in its class; hence you can stop questioning or worrying about the toughness, flexibility or strength of this mighty beast! The fully thermal Clam Bigfoot XL6000 has a centre height of 6 feet 6 inches, so you definitely have loftier, comfortable headroom both in standing or seated position. This beautiful ice fishing harbour sports an enigmatic bright blue shade and is guaranteed to provide you with all the warmth you need during the coldest days and freezing nights. 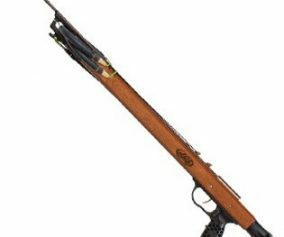 It also features super-duty, flex-tested 11mm poles which are both lightweight and sturdy, so there’s absolutely no doubt about the protection or durability on the higher end. The Clam Bigfoot XL6000 Pop-Up Ice Fishing Shelter is loaded with oversized skirt for ample snow backing and at the same time comes with six ice anchors plus tie-downs. All these are so engineered to provide you with the ultimate protection from the harsh cold climate including tremendous windy conditions. In addition, this big beast sports multiple windows to allow plenty of sunlight to enter and at the same time, gives you the prefect viewing area from inside to see what’s going on outside in the cold fishy climate! 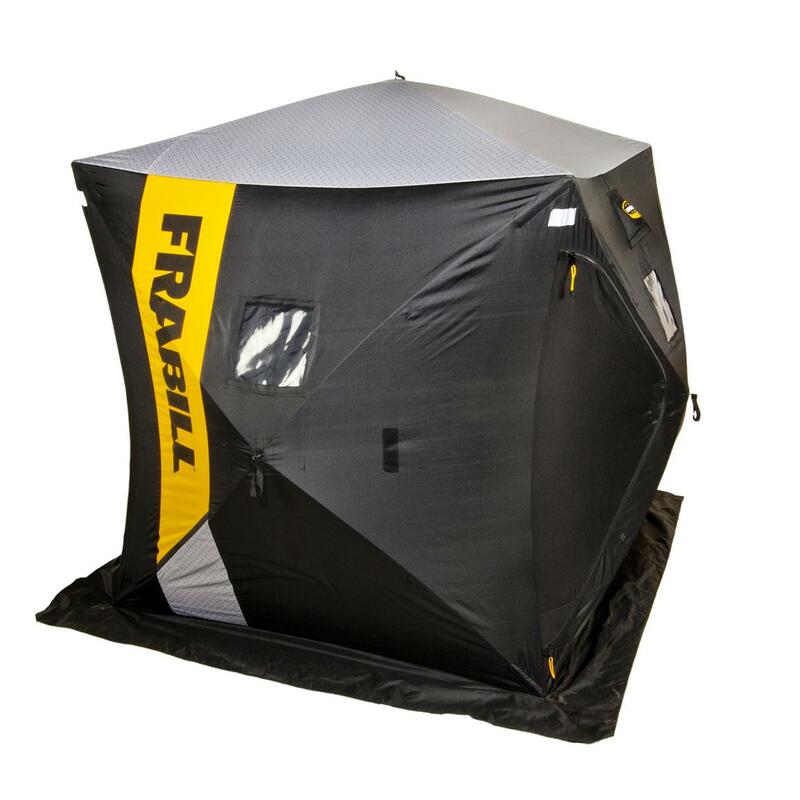 The Frabill HQ200 Ice Fishing Shelter is the most affordable of the lot but in terms to toughness, flexibility, strength and design, this pop-up shelter is a man of its word. With spectacular features in such cheap price tag, this is one of the hostelling items in the ice fishing world at present. Sporting the strikingly good blackish grey look, this Frabill model is a sure ice fishing harbour to make a home run! Weighing a handsome 24lbs and occupying 34 square feet area, this shelter from Frabill has enough room to accommodate 2 to 3 anglers along with their essential fishing gear. Most importantly, the occupied area is neatly combined with a remarkable ventilation system. 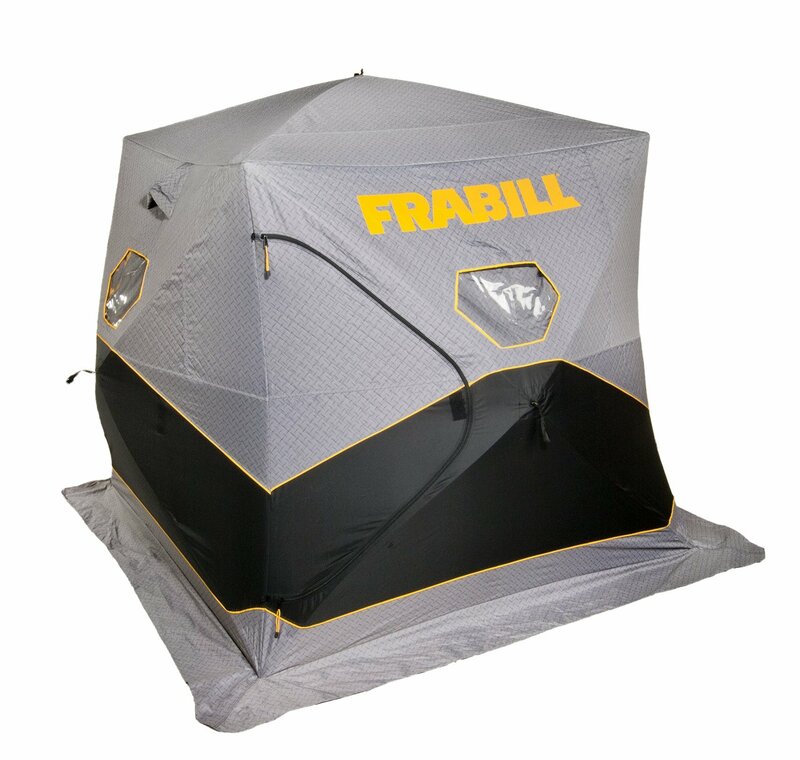 Cutting it short, the Frabill HQ200 Ice Fishing Shelter features the unique MaxVent technology with 8 2”×2” safety reflectors which remarkably adjusts for optimal venting thereby, keeping the inside constantly filled with fresh air. This Frabill model is made of 300Denier polyester to ensure maximum durability and insulation. In addition it is also lightweight and portable, thanks to the beautiful and exclusive zippered transport bag which comes with the shelter. Measuring 70” long, 70” wide and 80” tall, this highly thermal unique ice fishing harbour is built tough to last several seasons. The Frabill HQ200 Ice Fishing Shelter is equipped with a quick set frame which boasts of a superior high profile roof thereby providing extra headroom as well as elbowroom. In addition, it features 4 removable windows which provide you with a striking clear view of the outside world, backed with front and rear doors that come with heavy-duty, ultra-tough and super-smooth zippers. The pop-up shelter also includes additional polyurethane coatings to keeps light and water out. This handsome sporting shelter from Frabill is well crafted and highly insulated to keep you warm and dry even during the coldest of conditions. It also includes anchor kits; also boasts of a thermal floor which keeps you extra warm and allows for easy access to the ice. The Frabill HQ200 Ice Fishing Shelter is undoubtedly a mighty and unique ice fishing harbour delivering all the necessities that you require in the cold distant world out there! If you have any suggestions for the best ice fishing shelters, please let us know in the comments. 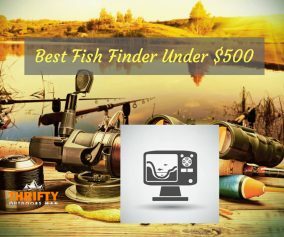 If you are looking for a great fish finder to go along with your ice fishing shelter than check out our post where we look at the best fish finder under $500.